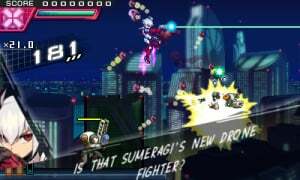 Azure Striker Gunvolt, released in 2014, played like a true successor to Mega Man, though with its own ideas at the forefront. Two years later we've received its sequel, Azure Striker Gunvolt 2. With the disappointing mediocrity of Mighty No. 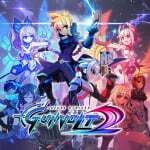 9 just a few months ago fresh in everyone's minds, a project in which developer Inti Creates was involved, does Gunvolt 2 do more to satisfy action game fans? The first thing you'll notice about Gunvolt's sequel is how comparable it is to the original game. The art style, controls and gameplay are all almost copied right out of the first outing. Thus, we find ourselves again in a futuristic Japanese world where Gunvolt, an Adept, must take on other Adepts, this time to save his friend. This means that when playing as Gunvolt you'll be working with the familiar mechanic of tagging enemies with your pistol, then using your Flashfield to attack them from anywhere on screen. You can tag enemies up to three times to do extra damage to them as you use your electric blast. 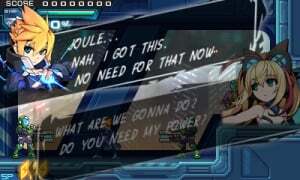 This is the main way that Gunvolt fights, and you're rewarded for mastering its use throughout the game. There's plenty of room for customization on your quest. Your basic gun fires straight ahead, but since you can only shoot left or right that quickly becomes limiting. Alternative weapons allow you to penetrate multiple foes with one shot or shoot crawler shots that hug surfaces. You're also able to add additional equipment that gives stat bonuses, like taking less damage in exchange for a weaker Flashfield. 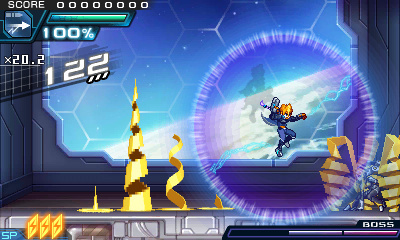 In true Mega Man style, Azure Striker Gunvolt 2 follows a semi-open level structure. You're required to play through a few opening levels before being able to choose from four in any order. After this there are four more levels to play through. Each level holds its own boss at the end, and these are unfortunately uneven. Some bosses are easy enough that they can be taken down on the first try, while others move so quickly that it feels like your only hope is trial and error to memorize their attacks over a number of attempts. Overall, the game's controls are pretty solid. The layout makes sense for a game of this type, and you can even use the New 3DS-exclusive ZL and ZR buttons to switch between weapon types. The only major problem we found with the control was the ice physics heavily present in one stage. They're incredibly heavy, and thus result in you having to jump all over the place to keep from careening off an edge. With some fairly precise platforming required, the ice level was definitely a low point. One of the (only) big changes that the sequel makes to the formula is the introduction of a new playable character. Each time you load your file you're able to choose between Gunvolt and Copen. Copen is not an Adept; rather, he hates them and is seeking their destruction. This brings in another familiar Mega Man facet — each time a stage boss is defeated, Copen gains a new weapon to use. Copen's base attack is different than Gunvolt's. Instead of tagging enemies and shocking them from afar, he dashes into enemies to lock onto them and then fires auto-aiming bullets to them. It requires you to be more up-close and personal to your foes, but does ultimately result in a similar system. There's a lot of popping out, tagging an enemy, and holding the fire button until they're dead in this game. Like the bosses, the level design is also inconsistent. Some stages make use of interesting mechanics, like dual-coloured platforms that appear or disappear depending on whether Gunvolt's Flashfield is in use. Other levels, however, feel a little boring after a while, as they struggle to stand out. The story is more of the expected, ultimately. The plot that plays out in the base between missions boils down to "go here and do this to advance the plot," with some awkward romantic tension thrown in for good measure. Since the entire game is dubbed in Japanese, there are dialogue boxes everywhere in this title. In the opening levels of the game, you'll stop what feels like every minute for a mini-cutscene full of dialogue. Even during later levels you'll be seeing text boxes pop up regularly with dialogue that's usually not important to the task at hand. Seeing as the top screen already has a lot crammed into it (with your score, energy meter, and more on-screen at all times) being in the top-left part can mean not being able to see, and this continues to happen during boss fights; it's fortunate that the developers allowed players to turn off the dialogue boxes. This results in you not knowing what's going on between the characters, but in this case it's better not to be distracted. The game's graphics are excellent, as would be expected — they're not pushing the system by any means, but have an attractive Genesis-like feel to them, and the 3D is subtle but adds a lot. The music is pretty solid, as well. In a lot of regards, this game almost feels more like an expansion pack to the first. One issue here is the save system. The game does not save automatically after a stage, which is expected following the first game; you must save in the menu in between missions if you want to record your progress. The feature isn't an issue as such (especially as we saw it in the original), but other design choices make it problematic. After clearing the intro level, for example, we were immediately thrust into a second stage, with no opportunity to save. This manual saving is particularly noticeable on occasions when the game tosses you into a new level to fight a boss as soon as you've just completed a notable area. With this being a portable game, not being able to save when you want to can be a real issue, leaving you occasionally reliant on snapping the system shut into standby if you need to take a break or get back to the real world. 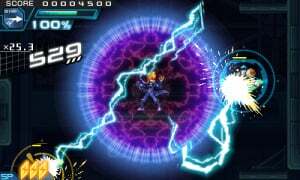 Azure Striker Gunvolt 2 isn't an overly long game. 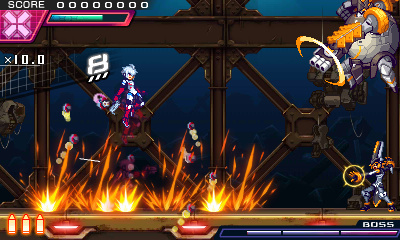 With ten levels being present for each character, you're probably looking at 2-3 hours each for Gunvolt and Copen. There's plenty of opportunity for replayability, however. Challenges provide extra objectives to complete in certain stages — some are busy work, like completing a given stage three times, but others are real challenges and task you to beat a stage without tagging any enemies. Beyond this the upgrade system, where you're granted materials at the end of each stage, encourages multiple playthroughs for completionists. The challenge is balanced overall, but specifics are up to you. The game's scoring system allows you to take only a few hits before losing your combo, but you can adjust it to make things easier at the expense of point earning potential. Unfortunately, death doesn't have much of a consequence here, particularly during bosses. As there's always a checkpoint before a boss, you can continue to brute-force your way through a fight until you manage to win. Azure Striker Gunvolt 2 is a good game, and while it really plays it safe by being so similar to its predecessor, it's an easy recommendation for action genre fans. For everyone else, however, it's a bit more of a mixed result. The level design and bosses are uneven, resulting in some levels feeling fun and challenging while others are less enticing. Couple in the save system issues, bland plot and incessant dialogue, and it's easy to see how some wouldn't fall in love with this title. However, it's a solid action title. The two characters are different enough to provide good variety, there are a lot of items to help customize your approach, and if you're up for replaying the game there's a lot to work at. If you liked the first Gunvolt, love Mega Man, or wish Mighty No. 9 would have been better, this game is for you. Those looking for something fresh, an interesting story, or an action game to play in bite-sized pieces on the go may want to think twice. Even with the shortcomings, this reads like a game I'd really enjoy, and the screenshots look right up my alley. It's a shame these are't available for WiiU as I'd love to play them on a proper telly. No mention of Runners Mode which supports online leaderboards? That unlockable mode is equivalent to Speed run mode in Gunvolt 1 PC Steam version but instead of being a full game run, it is more focused on individual levels. Players can aim for a very high score or a very fast time by following certain rulesets. Because of that mode, Gunvolt 2 has more value over the 3DS version of Gunvolt 1. The ice level can be challenging to non-Mega Man players but there's anti-ice cooling devices which makes the level easier. I do agree that the Flashfield's secondary use for stage obstacles in general were toned down. No magnetism, no light switches. In fact Teseo's red/blue platforms segment is the only new obstacle element that I can remember so well. Another big change is wall jumping, it's now possible to retain dash speeds after performing a wall jump. Loved the first one, so far, been loving this one. I'll stick with the first ASGV for the time being, then. @theultimateabsol You don't have to do the challenges, you just have to finish both stories and then defeat the last boss with either character a third time. The game is a solid 8.5 for me, and it improved upon the first game in most aspects. It just feels more fun, specially learning how to use Copen properly, which will let you to run through stages even faster than gunvolt if you do it right. The bosses are actually harder with more interesting patterns if you don't abuse a forgiving game mechanic that can be turned off for those that like more difficulty. The game gives you the option to make it a really easy game, or a really hard one, something really appreciated in my case. While I do get the "megaman vibe" from these games they are unique enough to recommend it to fans of the action platformers. If you like anime style games and stories then you have an even greater plus. Also, if you like these kind of games but get easily frustrated because you aren't very good at it, the rpg aspect of the game and the mechanic I already mentioned make the game way more accesible for everyone. Something I really appreciated: Copen and Gunvolt feel more different and unique despite both using guns than Megaman and Zero in my opinion. For some reason, using Copen reminded me of Zone of the Enders: The second Runner. theultimateabsol is talking about another kind of ending which involves a member from Gunvolt's team and a member from Copen's team talking to each other on how the plan worked out and possible tease for another sequel. @Greenalink Oh, my bad. I thought the story was complete because the runner mode only unlocks after completing the story. Nice to see I still have another thing to discover! I think it's better than the first one. More content, more replayability, better paced level design. And Copen is cool to play and is basically an easy mode. And his gameplay reminded me Sparkster or Pulseman. At least a 9/10 here. The game fixes everything wrong with the 1st and adds a second character that is way more enjoyable than GV. I loved the first Gunvolt, so I'm pretty sure I'll love this one, too. Getting the game soon... wanted to complete Fire & Ice first, and I'm almost done with it. Can't wait to try out Copen! It says something about the fickleness of number scores that the first game got a freaking 9/10 here and then the second, despite making notable improvements over the first, gets a 7/10. Nice review and nice score. I download it when it gets cheaper. I tried the demo of the first game and didn't get into it. So I'll probably skip this one. A shame that it's like an expansion to the first when the first one felt like a step back from Inticreates days on Megaman Zero etc. I loved those games, but ASGV 1 did not hit those highs for me. One thing in the review I noticed that is not correct you can save when ever you want pressing the L button brings up menu screen where you can save your game at any point . I also don't agree with score this title is every bit a 9 out of 10 in my opinion it is so much better in every way over the first title , I really hope they are working on a third title great series so far . Played the game via the Striker Pack and my personal score is an 8/10. I find these games really addicting. I hope Gunvolt 3 becomes a thing. I've been replaying the early levels over and over because I can't really get a good hold of Copen's mechanics, but it's interesting. A couple of the bosses are kind of out of place, being more puzzle bosses than anything else. I'm enjoying it quite a lot though. The straight-out-of-a mid-2000s anime harem antics could be toned down a bit. I suppose I should be relieved that Rie Kugimiya's grating voice isn't part of the ensemble. I'll pick up the physical Striker Pack version once it hits here in Europe. I haven't played any of these games yet, but I do love me some Mega Man Zero, so this should be right up my alley. I'm waiting for the bundle game with both games, but I'm glad this one is good. Absolutely love both games. I found this one a bit short, but is still engaging none the less. Also, it seems to be MUCH easier to play as Copen after you understand his play style. Like the 2nd to last boss took me like ten tries with Gunvolt, but only 1 with Copen. And I was barely even scratched. I definitely consider myself a fan of Gunvolt after how good the first game was and I will no doubt end up enjoying this one as well. Seems like it is more of the same, which in this case is a good thing for me. Ice levels are the bane of every platformer's existence. It's beginning to look just like an ice world! Your Zelda item gif is so cool! Azure Striker Gunvolt 2 is an outstanding sequel to one of my favorite 3DS eShop games from 2014. 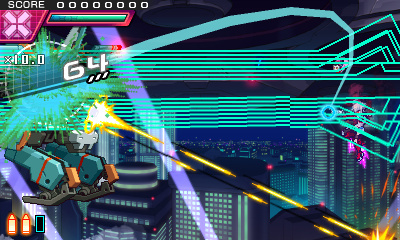 It’s fun having two playable characters with unique playstyles; Copen takes some getting used to and his aerial maneuvers are similar to Rocket Knight Adventures, Pulseman, Ristar and Freedom Planet. I do feel Gunvolt 2 is slightly shorter, but it's nice having more challenging bosses and better paced stages this time. Speaking of which, those bosses really weren't messing around with their attack patterns here. The streamlining of the game's systems from accepting challenges and item upgrades is also appreciated, as with keeping mid-stage dialogue and voice acting intact (and you have options to turn them off along with the story events). It's too bad that some challenges still must be unlocked by order, which may be irksome if the player had already scored a high rank or better. While I personally enjoyed the first game, the sequel feels more polished while having more content and replayability. Kudos again to Inti Creates with the Azure Striker Gunvolt series and I look forward to a third game when the time comes. The Japanese Voice Mode is finally coming to ASG1 on October 20th! Now I can finally digitally purchase Gunvolt 2, since otherwise I'd have to import the Striker Pack. Can't wait to blaze through the JP mode before I get cracking on ASG2, which looks fantastic. The game is so reminiscent of Megaman Zero minus the closer sword combat. Looking forward to the physical release.